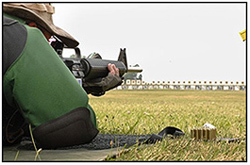 The Civilian Marksmanship Program (CMP) is a U.S. government-chartered program that promotes firearms safety training and rifle practice for all qualified U.S. citizens with special emphasis on youth programs. 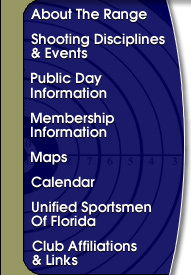 The CMP operates through a network of affiliated shooting clubs and state associations that covers every state in the U.S. 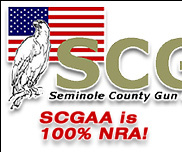 The clubs and associations offer firearms safety training and marksmanship courses as well as the opportunity for continued practice and competition. History: The Office of the Director of Civilian Marksmanship (DCM) was created by the U.S. Congress as part of the 1903 War Department Appropriations Act. The original purpose was to provide civilians an opportunity to learn and practice marksmanship skills so they would be skilled marksmen if later called on to serve in the U.S. military. Over the years the emphasis of the program shifted to focus on youth development through marksmanship. From 1916 until 1996 the CMP was administered by the U.S. Army. Title XVI of the National Defense Authorization Act for Fiscal Year 1996 (Public Law 104-106, 10 February 1996) created the Corporation for the Promotion of Rifle Practice & Firearms Safety (CPRPFS) to take over administration and promotion of the CMP. Bullseye Pistol, also known as Conventional Pistol, is a shooting sport in which participants shoot handguns at paper targets at fixed distances and time limits. Emphasis is on accuracy and precision. The sport is primarily popular in United States and Canada, although it was also the inspiration for the international 25 m Standard Pistol (82 feet) event. Equipment: Bullseye specifies three classes of pistol; a .22 caliber rimfire, a centerfire pistol of .32 caliber or larger; and a .45 ACP pistol. Since the format includes a rapid fire stage, a semi-automatic pistol or revolver with a capacity of 5 rounds is needed. Courses of fire: All courses of fire are fired from a standing position, using a one handed grip. This is a significantly more difficult shooting position than the two handed grips used in action shooting, at "bullseye" targets significantly smaller and farther, although time restraints are relatively more generous. Depending on the match format, the competitor may be required to shoot as many as 90 rounds from each of three handguns. Each shot scores a maximum of 10 points. Hence, a one-gun competition is often referred to as a "900" whereas a three-gun competition is a "2700". A shorter form is the National Match Course consisting of a single Slow Fire, a Timed and a Rapid Fire target, 30 shots for a maximum score of 300. 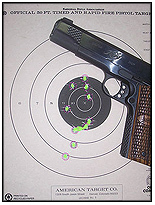 Single gun competitions using only the rimfire pistol are common, as they provide an inexpensive entry into the sport. Outdoor competitions are typically fired at 50 yards (slow fire) and 25 yards (Timed & Rapid Fire) using the same target. A "short course" will shoot only at 25 yards and use a reduced-size target for the Slow Fire segment. All courses of fire at an indoor competition are typically fired at 50 feet with appropriately scaled targets. Many individuals become interested in smallbore rifle competition; however, unless they start off with the proper information, they find it difficult to begin. The cost of equipment is generally a stumbling block. Many feel that unless they have the best of everything they cannon compete. This is not true. Most start with a minimum investment of a .22 caliber rifle (new or used), spotting scope with stand, sling, glove and shooting coat, and most important, eye and ear protection. Section 3 of the NRA Smallbore Rifle Rule Book defines authorized equipment and ammunition. This section is not meant to restrict equipment but to define limitations. Rifle - (light rifle or match rifle) Whichever rifle you select, be sure it will be suited for the rules of the particular type of shooting you wish to do. A reliable gun dealer is most helpful in selecting a proper rifle. Remember, a used rifle for a beginner is not a bad idea if the dealer can certify the condition of the rifle. Rifle Sights - After checking the rules, the purchase of good quality sights for whatever type of shooting is a sound investment. Spotting Scope/Stand - It is the most important piece of equipment after the rifle and rifle sights. Allows you to check your target from a distance. Spotting scopes are precision optical instruments (often you get what you pay for). Scope stands should be suited for the job you will want them to do. Gun Case - Used to protect your rifle as you travel to and from the range. Necessary in some areas to comply with local laws. Ammunition - Generally, standard velocity ammunition will shoot more accurately than will high velocity. If you wish to become more competitive, tournament quality ammunition best suited to your particular gun will give the best results. There are many accessories available and no attempt will be made to mention them all. Some of the most common and useful ones will be discussed. Shooting Box or Kit - Some means is necessary to transport your accessories to and from the range. This can be as elaborate as a leather case or as simple as a large box or cloth. The choice will depend on the type and amount of shooting you do. Specialty Equipment - Shooting mat, shooting coat, glove, sling, kneeling roll, shooting pants, shooting boots - are too varied to mention. The purchase of such equipment depends on personal preference. However, some of these pieces of equipment can be essential depending on the type of competition in which you wish to become involved. Smallbore rifle competition is held over distances of 50 feet, 50 yards/meters, and/or 100 yards. 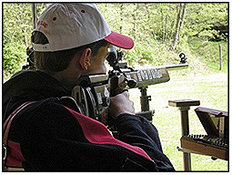 Match competition can be as quick as 30 shots (10 shots prone, standing, kneeling) in a league or as long as 40 shots at the National Championships. Competition is conducted in as many as four positions - prone, sitting, kneeling, and standing - to as few as one - prone only or standing only. Section 7 of the Smallbore Rifle Rule Book discusses all courses of fire recognized by NRA, while section 17 covers all courses of fire recognized for national records. Smallbore rifle competitions may be fired outdoors or indoors. A group of matches added together for a total aggregate score is called a tournament. They can be held locally, state-wide, regionally or nationally.